PORT ROYAL, Pa. –Trey Starks of Puyallup, Washington, struck of his first career Port Royal Speedway sprint car win on Saturday night, out-dueling Aaron Reutzel and Greg Hodnett for the victory, worth $3,600. In the 30-lap Tri-Track Late Model Challenge event for super late models, Jeff Rine held off the advances of Dylan Yoder to pick up his third win of the season at the track, worth $3,000. And the 15-lap xtreme stock main was taken by Kevin Imes to close out the night. Jared Esh and Trey Starks began the 25-lap 410 sprint car main on the front row and Starks raced into control when action got underway with sixth starter Aaron Reutzel of Clute, Texas, blasting into second on the first lap. Point leader Greg Hodnett started eighth in the field and followed Reutzel through on the opening lap to take over third. 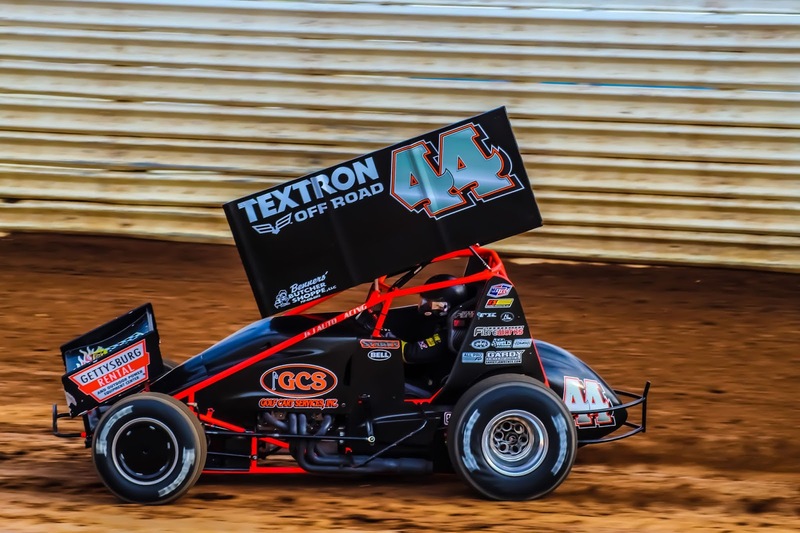 But Hodnett would struggle to keep pace with leader Stars and Reutzel as the field strung out and the race entered traffic on the sixth tour. While both leaders were slinging around the top, Reutzel gradually closed in on Starks and took his first stab at control on the 12th tour when he attempted a dive underneath in the third turn only to come up short and lose some ground to the leader. Reutzel regrouped and again dialed in for the lead and took another shot in the third turn with 10 laps to go, again coming up short and losing ground. It took two more laps for Reutzel again to catch the leader as he worked traffic and this time he put on a blast across the bottom that netted him control as he slid up to catch the cushion in turn four. Not to be outdone, Starks turned the car and dropped off of the cushion to drag race Reutzel up the frontchute as the pair headed to the line. Reutzel came down across the track in an attempt to thwart Starks but the Washington pilot reclaimed the lead at the stripe, albeit a narrow advantage. Seconds later, Reutzel blew a left rear tire and clouted the third turn wall, ending his race. The restart put Hodnett on Stark’s tail with Hodnett taking his shot in the first turn as he attempted a bottom groove move to take the lead but Starks rode his outside lane momentum to drive back around Hodnett and maintain control. After the restart skirmish, Starks worked around the track to take the win aboard Scott Gobrecht’s No. 44 by 1.750 seconds ahead of Hodnett. TJ Stutts was third followed by Brock Zearfoss and Jared Esh. Sixth through 10th went to Anthony Macri, Blane Heimbach, Dylan Cisney, Gerard McIntyre Jr., and Mike Wagner. Starks became the 190th different driver to win a sprint car race in the history of Port Royal Speedway. Heats went to Paul McMAhan, Stutts and Starks with AJ Flick taking the consolation. Dylan Yoder and Jeff Rine held the front row to start the 30-lap Tri-Track Challenge race for the super late models and Rine edged ahead of Yoder on the first lap. Only the first five laps could be recorded before Andy Haus blew a rear tire, bunching the field for a restart. Yoder worked the high line throughout the entire race, keeping pace with Rine during the first half of the event but failing to challenge. A second caution flag unfurled with 14 laps to go and the restart again saw Yoder challenging Rine for command. As the event wore on, Yoder’s outside runs seemed to be working better and with five laps to go, he was nose to tail with Rine in traffic. It was then that both leaders nearly crashed out of the event as they raced behind a backmarker onto the frontstretch. With the slow car in their line, Rine refused to yield the lane for another line and Yoder got a great run off of the fourth corner. This bottled up the pair with Yoder getting into Rine’s rear deck and Rine wiggling, nearly getting out of control as he tried to avoid running into the slow car just in front. Somehow, both drivers recovered to keep their cars straight and then Rine drove away during the final three laps for the win. Yoder crossed the line 1.427 seconds behind while Kyle Lee finished third followed by Tyler Bare and Coleby Frye. Sixth through 10th went to Matt Cosner, Jerry Bard, Tim Smith Jr., Mike Lupfer and Andy Haus. Heats went to Rine, Frye and Yoder with Chris Casner winning the consolation. Kyle Lee set quick time over the field with a lap of 19.292 seconds. Kevin Imes led all 15 laps of the xtreme stock main to record his first win of the year and the second of his Port Royal career. Josh Bender and Jeremy Stremmel rounded out the top three.